When you’re using Server-Powered mode, you have two options available in the summary section of the soSIMPLE Calendar Settings. This setting determines how you interact with your calendar. 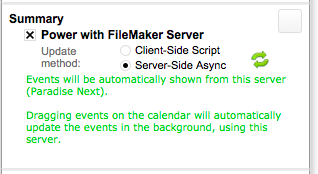 Every time you add or edit an event, a script will run in FileMaker Pro. This allows you to use your own FileMaker script and layout to perform the data entry. You can choose for that script to provide a data entry form, or have it perform a task automatically. This is the option you’ll typically use within FileMaker Pro or FileMaker Go. The script is defined as part of the data source in soSIMPLE Calendar Settings. The default script is called “soSIMPLE Calendar Actions”. It’s explained in more detail here. Changes are performed automatically on the server, without interacting with FileMaker Pro client. This is great for simple data-entry, web or WebDirect deployment. It happens very quickly in the background, so that you don’t need to wait for the calendar to redraw before moving forward.